Happy Monday! It’s our first week back for our Virtual Book Club for Kids and this week’s theme is apples! We’re reading Ten Red Apples by Pat Hutchins. 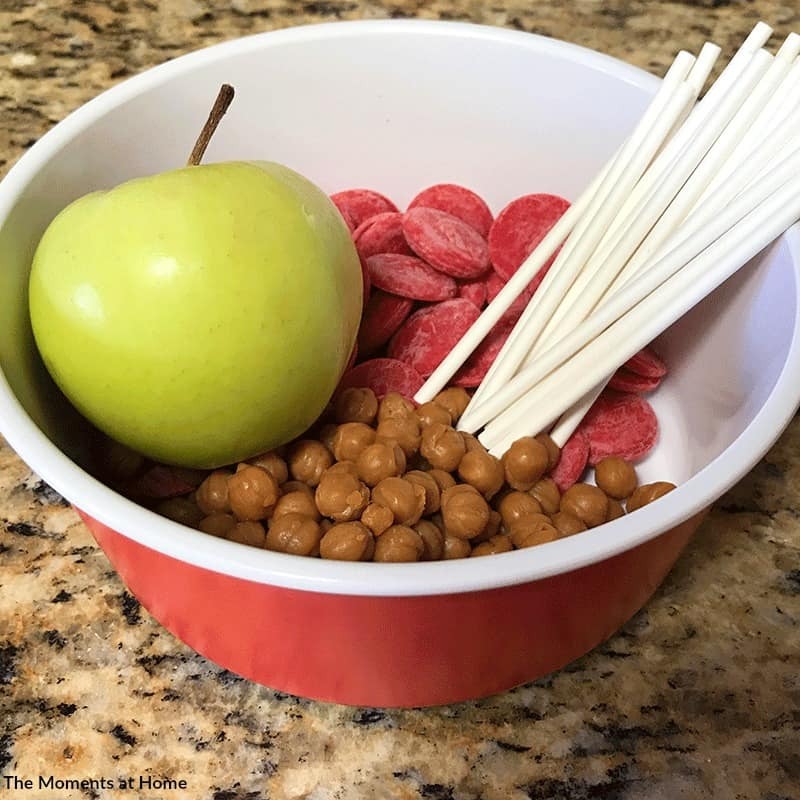 This week the Virtual book club co-hosts are sharing fun apple themed activities to go along with the story. Be sure to scroll down after reading this post for more activities based on this week’s theme! 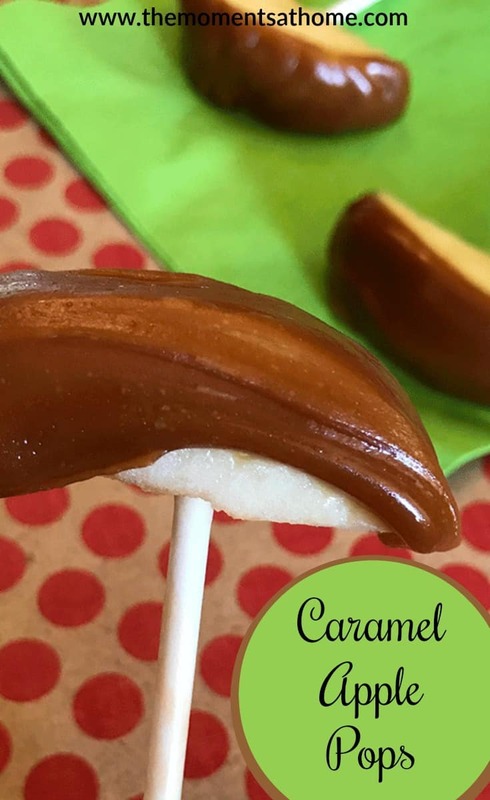 This week I’m sharing an easy caramel apple pop recipe that’s perfect for fall! Bright colorful illustrations cover the pages of this count-down children’s story. Ten red apples are in the tree but the farm animals are eating them! Kids love the cute rhyming words and repetition as they count down to see if there will be enough apples left for the farmer. Begin by pouring the caramel bits into a small saucepan and heating them on low. Stir occasionally while you prep the apples. While the caramel is melting on the stove cut the apples into 1/4 inch slices and trim away the core. 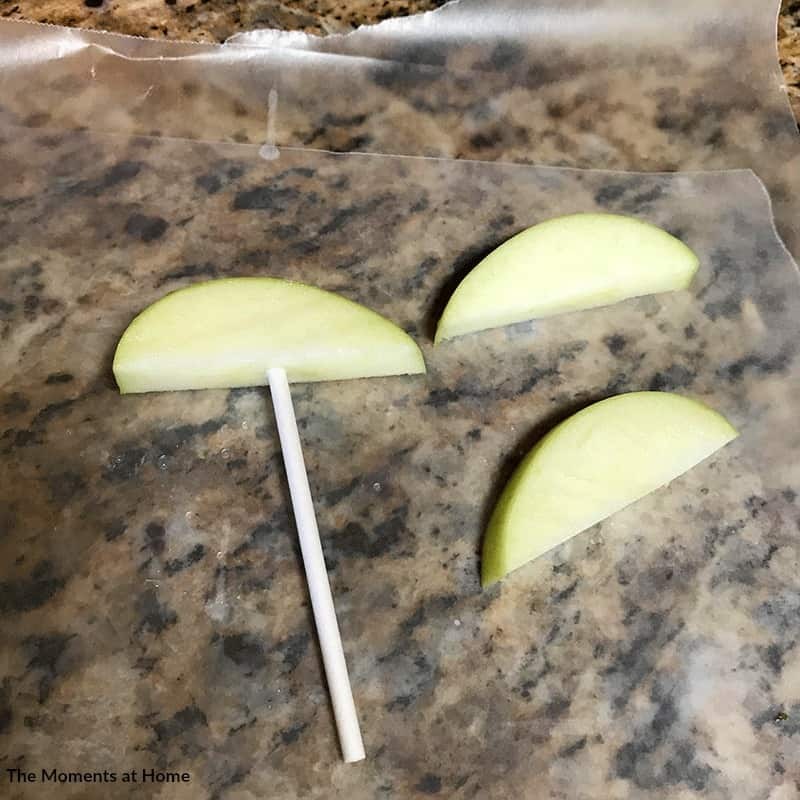 Push a lollipop stick into each apple slice. Pat each apple dry with a paper towel to soak up any moisture on the surface. The caramel won’t stick well to the juices of the apple. 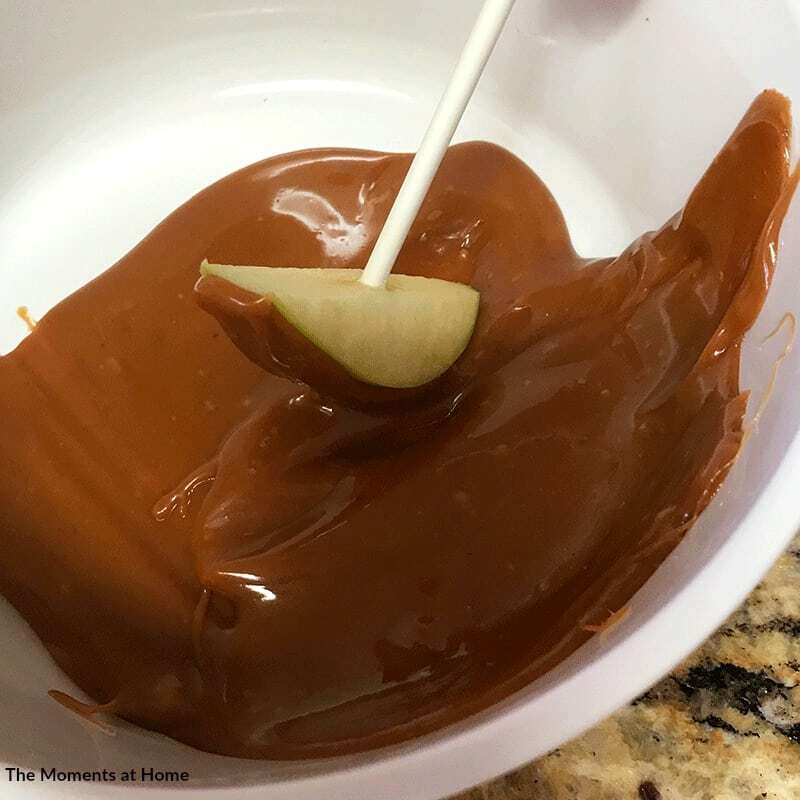 Once the caramel is melted hold onto the stick of the apple pop and dip the apple peel-side down into the caramel. We chose to cover only the peel of the apple for our pops. If you’re using the red candy melts read the directions on the package for melting instructions. 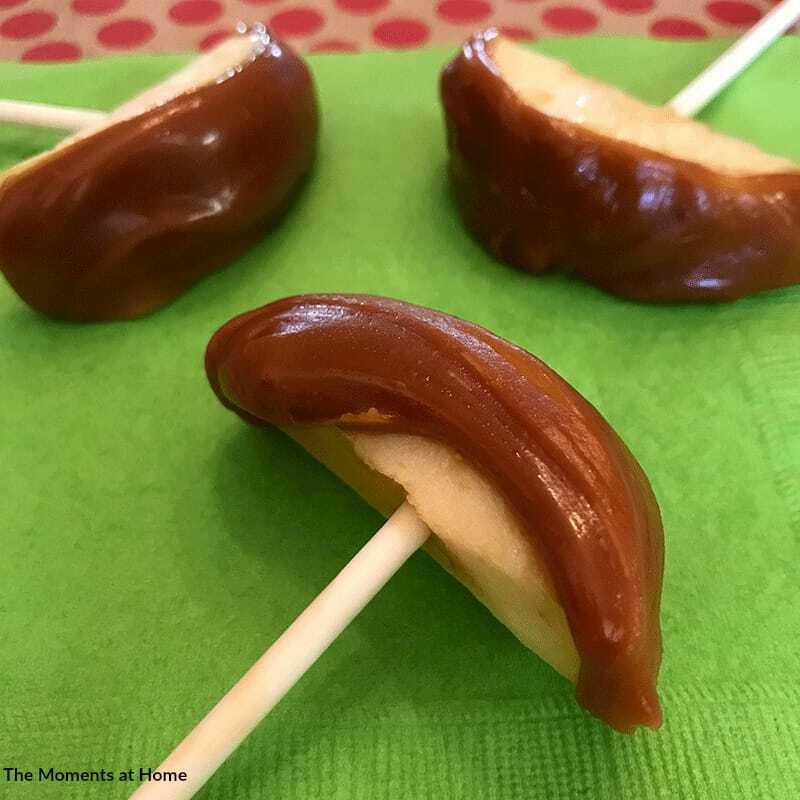 Once the candy melts have a creamy texture dip the apple pops into the candy to cover the caramel.